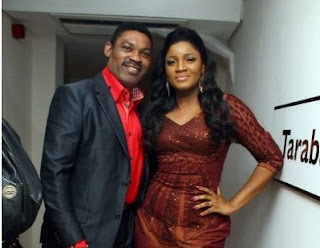 Nollywood screen goddess, Omotola Ekeinde while vacationing with her husband in Morocco has announced that Moroccan men had taken a liking to her because they think she looks like their ‘wives’, and this sort of made her husband jealous because he joked about leaving her behind. The duo jetted off to Morocco last weekend for their 21st wedding anniversary, and since have been sharing details of their fun times with their fans. Yesterday, the couple went on a boat trip and Omotola was allowed to play a captain, and she made sure to rub that in her husband’s face. “We were allowed into the Captain’s bridge and I was allowed to steer the wheel !!! Haha…and a flight Capt met a ship Capt! Lol…what an experience. #Dakhla to #casablanca#cransmontana17 #cmf p.s *network’s been bad on the cruise so forgive,” she said. The couple have maintained the tradition of flying out to hotspots in the world for their wedding anniversary. Last year, they celebrated their 20th year together in Hawaii, and now they are getting a feel of Morocco.